IT’S not the confidence — he’s always had that. It’s the snarl and the menace. Imran is moving in for the kill. And this time the prey is in sight and within reach. Nawaz is in trouble. Locked in a self-created pincer, he’s given reason for his ouster — national security threat! — and given the means, too — corruption! The dilemma for Nawaz has been that if he cuts one loose, the bleeding will never stop — more and more heads will be demanded. The oldest of scripts is back. If everyone else can see it, then you can bet Imran sure as hell can, or has had someone show him. From here, the plan ought to be straightforward. Get people to flow towards Islamabad on Nov 2. Not in large numbers, but just enough to cause alarm. Because the government is already alarmed, even the minimum could work. A bunch of stragglers here and there chanting and marching towards police barricades, TV cameras in tow. Then, let the government do its thing and be its ham-fisted, overkill, aggressive self. Police charging at protesters, women getting roughed up, men being thwacked over the head by batons; melee and mayhem. In minutes, a national crisis — and space for real danger. The real danger being blood on the streets. A policeman too quick to use his gun. A protester armed with more than stones and his fists. An interloper inserted to create mischief. But the N-League has several cards of its own to play. First, it has disrupted the PTI’s run-up to Nov 2. Scattering protesters, detaining leaders — it will have an effect on potential crowd size next Wednesday. That could reduce the protests to a manageable level, allowing for the police to remain disciplined and the N-League to not go into full panic mode. Second, the N-League could release some pressure on the civ-mil front. 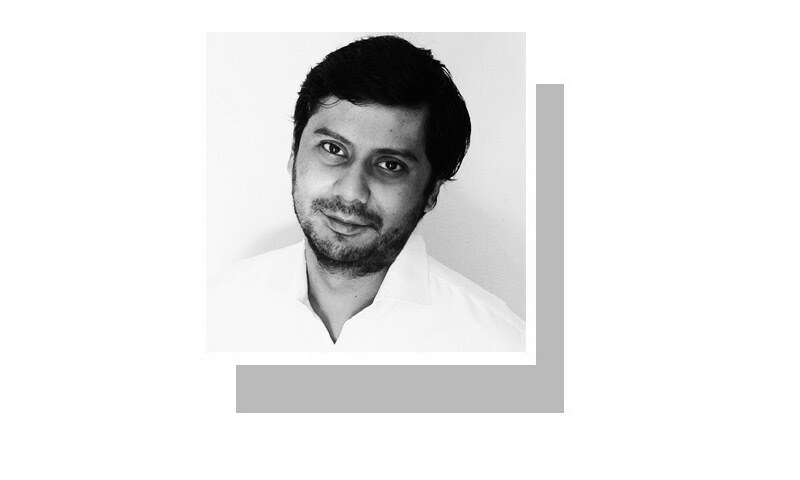 Offering up Pervaiz Rasheed, albeit temporarily, and green-lighting a military-heavy inquiry buys time — and casts doubt over the finality of Imran’s mission. In the 24 days since the story dropped, this much has been clear: the military wants to hack away at Nawaz loyalists who have long been judged too hawkish — and dangerous because they’re willing to take risks. But the dilemma for Nawaz has been that if he cuts one loose, the bleeding will never stop — more and more heads will be demanded, in this round or the next, whenever that arrives. So why not make the best of the worst and do a partial sacrifice that gives something to both sides just as the PTI threat is peaking? 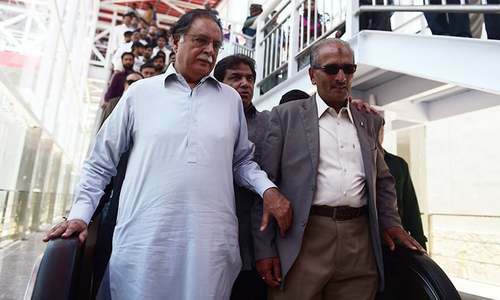 The suspension of Pervaiz Rasheed helps address the military’s demand for someone significant to be offered up, while the at-the-moment temporary punishment offers solace to Sharif loyalists that the boss won’t just abandon them to the wolves. And given that Imran’s protest has been turbocharged by the spectre of acute civ-mil discord, the suggestion that a solution is being worked towards on the civ-mil front helps Nawaz defuse the Imran threat. Third, Nawaz could just appoint a new chief. It has been an option from Day 1, but it also quickly became apparent that it is the option of last resort, the nuclear option. The problem for the N-League isn’t the will, but the way the military works. Appoint a new chief with the other guy still having a few weeks to go and all power doesn’t immediately drain away from the latter and flow to the former. The chief is still the chief till his last day and as long as you’re chief, you’re all-powerful. And with the current chap it’s not like allies will suddenly desert him in the midst of a civ-mil fight. So, fiddling around with succession plans in the middle of a crisis is about as high-stakes as it can get. And then there’re the bits no one wants to talk about. Does the current chap want to stay on — same place, same job? Or is he at all inclined to try the ultimate? Here is where neither side can truly know, a blind game based on guesswork by each side about what the other wants out of it. What is apparent is that at its root, the present crisis is about power — who wields it, how they wield it and to what end do they wield it. The more Nawaz chafed at being sidelined in foreign policy and national security, the more likely it was that a crisis would emerge. Now, it perhaps comes down to two questions, one for each of the principals. For Nawaz: how determined is he to be something more than chief inaugurator of bits and bobs of road and electricity megawatts? For Raheel: how willing is he to believe that Nawaz will in fact go back into his box and stick to being inaugurator-in-chief and nothing more? If Nawaz wants more, he’ll bash the PTI and batter the protesters — a message to one and all that he won’t be bowed. Defiance could end in defeat, but it’ll force the other side to explicitly team up and for the real power struggle to come out in the open. 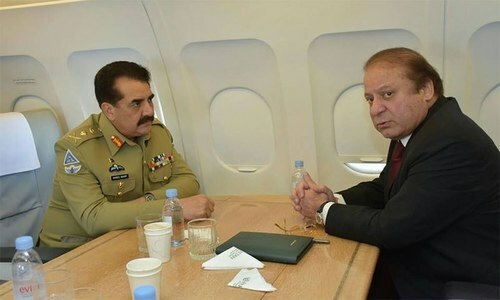 If Raheel doesn’t believe Nawaz can be convinced to return to his box and to remain there, the dogs of protest may be unleashed in the streets and hawkish Sharif loyalists hacked away quickly and determinedly. A national security threat who has pillaged the nation and corrupted high office can’t remain PM, can he? Nawaz can agree to the joint opposition's TORs or resign and let someone else from his party take over, as many others, including IK, have suggested. The government will complete his term and Noon will break all development records and win again in 2018. Since Nawaz is an ardent democrat, how could he object to such a solution, which is norm in all democracies? A wonderfully written article in difficult conditions. keep it up man. More and more people like your focus, independence and determination to right clearly in this miserable situation. Whatever is the outcome, you are the winner. Excellent Cyril....Your analysis and knack for calling things as they are can't be paralleled. Simply brilliant piece of writing. The problem is the Sharif family ...and not the world around it. Extremely well articulated. Kudos Dawn. It is always struggle between two power center and is not a PTI vs PMLN, as looks like. Really well written article. I guess government has given the scapegoat and showed the willingness to work with the forces, and who knows what they agreed on under the table as well. Forces are not willing to go to the next level i guess if government agrees to work on their terms. Still Imran will try his best to somehow invite them. So lets see what happens in the next few days. Wow Cyril, you still didn't talk about the ultimate goal of all this circus. Bravo Cyril. Almost you have revealed in real threat.......mean not from PTI but military. All the public support for democracy and no room for dictatorship. To be honest what goes around always comes around. The way Nawaz run his governance is like running his business. He never learns from his mistakes if he is so sincere to democracy then do party elections for PM and offer himself for Panama inquiry. Cyril is calls a spade a spade. Honest journalism. Man you are good! keep writing and never stop. May god go with you! Cyril, you suggest that military is responsible for all the mess. Nawaz has no offshore Panama accounts, there is no need of accountability in land of the pure and army is behind the conspiracy against your fake Nelson Mandela aka Zia's gift (Nawaz Sharif). A masterpiece from cyrill. Awe inspiring and bold writing. Stay stafe. It is more than time that the focus shifted from old men playing silly bugger to the issues of the poor, the weak and the sick. What about the corruption beast? Should we let it play with people lives. Its not Imrans fault if our PM is not morally strong to stand against any military pressure. Dont create fear in people mind. You are playing "Trump" here. NS corruption needed to be dealt with iron hands. Beautifully narrated, but too bold for the top power! Beaware! A spot on article for the current crisis and very well written. The problem started on Oct 7, 1958. Nothing new. The conflict is to control the minds of the people, and resources. End of story. Good analysis. Well articulated and bravely spelled out. But most of the populace wouldn't like to hear the the dirty truth about the high and mighty. Perhaps that's why no one now talks about corruption on CPEC, because now FWO is working on most of it. All hail the mighty of Pakistan. Very beautifully put up cyril. RS, NS and Army are mature now (much needed in new age), & we have high hopes from them. IK and PTI are as lame and opportunists as ppl say. Amazing article. In the current game of political chess, Imran Khan is just a pawn that is being played by the army. Nawaz Sharif has to make a choice to either take out the pawn for good or go back on the defensive and cooperate with the army. This is not a circus and not at all a game as this writer seems to think. It is about Pakistan and its national security. It is about some one very important colluding with our enemies to down our army. It is dangerous for the country and our nation. Civil government needs to show 3 things. Leadership, no corruption and transparency and rule of law. If the government is incompetent and appoints incompetent people on important positions, is involved in massive corruption and does not respect rule of law and merit then it loses moral ground and will come under pressure all the time. This has been the problem with all civilian governments especially PMLN. Everybody knew what the PM media cell was all about and why did he appoint his daughter there? Some one mow will have to answer that question. Wow, Dawn and Cyril still undaunted . The million dollar question is will the Chief hand over or take over. All of us want to come out on streets against Nawaz Sharif but yes we fear for our lives, we fear being arrested and baton charged. We fear for our children back home. Nawaz-league is as dangerous a Mafia as our agencies once were. They will just paint anything with conspiracies like the one in your article. Just agree to the TORs on investigation of corruption and end the crisis. But no you will target the people, abuse and malign the army call protesting women names. A dangerous party with a dangerous think tank no less than another intelligence agency. The lucid most, description of state of affairs. amazing thought provoking article! good job cyril. It is only a "power-struggle" Everything else is just rhetoric. People should not sell themselves to be pawns (as they always have been) in this. If anything will right the wrongs of people, it is neither in the Civ-Mil fight nor in the anti-corruption movement; it is only in the struggle for change of the whole system and power structure, the current constitution, political parties, media, Military/Economic doctrines, social setup, Foreign/Education Policies. So Who is offering that change? It does not take intelligence of Einstein to really figure it out! I don't think it is all about power. It is about principle. As a nation we must decide whether we want to behave like civilized nations or not . Our goal must be to root out corruption. This talk of so-called half sacrifices and things like appeasing boys or they will unleash etc. doesn't impress the progressive Pakistanis anymore . The world must know we are an honest nation and nobody should think otherwise!! This is an opinion and as opinion goes too much wishful thinking and speculation. A free speach has a limit and 100% solid information must be delayed or killed in the name of the National Interest. I can recall many news New York Times set for months because it could have jeopardise many lives and or National Interest. Now it is up to the reader and the writer to determine Nationa Interest. Excellent analysis. You are unmatched. Excellent Cyril, a very wells written article. Our problem is overpowered security institution! Musharraf did everything wrong and how it supported him to escape, but here only a news is enough to topple over a publically elected govt. India is watching what it can get from the crisis. Pakistan should manage this carefully. But who - Nawaz or Rahil ? A defining moment I think. A sharp analysis in amazingly simple language. A leader sets specific goals for a nation, and leads. The PM Nawaz can not do this. He can not do "more than chief inaugurator of bits and bobs of road and electricity megawatts". He is a businessman, and does not appreciate the significance of strengthening the Institutions of the State and the Parliament. In gist, it is a proxy war-sharif 1 vs Sharif 2. My information is Sharif 2 cannot do anything. CPEC's financiers, developers and owners will not allow Sharif 2 to anything that derails their ambitions. China is the game changer. Excellent analysis Cyril.. Keep up the good work. Very good article and analysis. Well articulated. This is the struggle between the shareef's to gain power. PTI is just a pawn. It's obvious. Cyril! You are more than perfect in your analysis. Well said. Every single crisis of the world is about power over others in one form of the other. I guess, Nov 2 is going to be turned into something ugly- showing the threat of National security. With Nawaz's position in danger, army would strike a clandestine deal with the civil authority that suits the both of them. @IBN E ASHFAQUE Looks like you are candidly endorsing the absolute power doctrine, which has not worked before and it will not work now. And if you think that absolute power is all "boys" game only, think again. The so called self proclaimed "democrats" are actually showing us, that they can do it much better by beating their chests and playing the " jamouriyat ko khatra hai" card. But the main cause might not be if the army wants to cede power when it comes to foreign policy, but its Nawaz breaking all records of corruption and not agreeing to the ToRs in the Panama scandal. Frictions between politicians and army will remain. But the nuclear option would never come to fruit. Times are not right for the chief to take over. @kanwarch in a democratic setup the military doesn't establish or judge national security. We will never move forward if we don't give the elected leaders the chance to implement their agendas. Beautifully written, bold analysis. Let us hope country wins and good sense prevails and future thrives for Pakistan. Both civ-mil need to grow out of their ego and look where world is and where we are and why we are in such a mess. No body trusts us, we have no prgress in any field, corruption on rise, nepotism every where and money and power rules and destroying us. Country should be first at every step and at any cost, PLEASE. One of the very best from Cyril. @Trotskyist Very interesting analysis. Sadly lacking in any solid evedence to back up tall claims. Spot on. Now is the time for NS to expose the IK and establishment nexus by upholding the writ of govt. If third umpire intervenes, it will at least clear the air around IK's movement and a sure end to his politics. Very good analysis. The democracy in Pakistan is hanging by the neck. Survives or defeated once again. We are watching .... the world is watching. There is no doubt in my mind that GRS is not leaving and will take over if an extension is not given to him. IK is just a useful pawn to that end. I thought like other countries we also care about right and wrong...honesty and corruption...If a corrupt leader is removed it is strength not weakness of the nation. @Saad Jadoon Yes it might be a power struggle but it is our duty as citizens of Pakistan to stand with the rule of law, to stand against corruption, to stand against neoptism, to stand for our basic rights of protection by police and against anybody using the police as their criminal wing. Tell me in which democratic system an Interior minister or Chief minister is able to give operational orders to Police chief. Perfect Analyses of the cumbersome situation. both civil side Imran and Nawaz are on knife edge, and latter when dust settle rogue will be more clearer. Indeed, " the ultimate " should have been done long ago. But since we, the people, provided every opportunity to him, to plunder in a big way and now he has bought every one and every institution, why shouldn't he use his plundered money as his power to , legally or illegally, crush any opposition? In the past, military take overs had taken place for, comparatively, less serious reasons. Frankly, at present, despite the proven massive corruption, serious national security breach and incompetence at the highest level, the military is refraining from any action. There may be wisdom in it beyond a common man's comprehension. However, it now appears that the well being of Pakistan is not the real objective of the prospective or ruling leaders. Nor is any leader concerned about the poor people of this country. Thus, it's reasonable to consider, all that is going on is, in fact, a foolish power struggle. Ideal and sustainable Democracy ,in Pakistan can be , when Nation led by COAS, governed by PM , as mamnoon husain (president) arrangement. Power is right of Hard working Army not lazy greedy civilions . Turkey like upside down revolution can't acceptable! @Trotskyist .... Shabaz Sharif has announced to the press that the defeat of the people is eminent. Very nice written,once again cyril has given us good analysis of situation. In the current scenario, it is clear that NS is, in no way, interested to sacrifice the big fishes related to NewsGate. Because "if he cuts one loose, the bleeding will never stop". Pervaiz Rasheed is another Mushahidullah Khan or Sanaullah Khan. Once NS is able to spend some valuable time, PR might be restored (and PR and PMLN members showed such confidence commenting on PR suspension). Nevertheless, my stated opinion is merely a fact if Army do not end up intervening using Army Act to arrest the culprits themselves. Whatever the outcome would be, the NS govt. ought to face to consequence of the "planted" story. Keeping the criticism aside, Mr Sharif has proven that he can handle 360 degree attack, in and out, and still retains the solid grounds. Bravo..! In retrospect, after the SC decision, it seems the situation wasn't really as bad as some made it out to be.